Critical Thinking Blog: All Opinions Are Not Equal: You Tip for That? As a follow-up to yesterday's post, today I'd like a quick list from each of you on what services you currently tip for? So that we can all realize who expects it from us, and make fun of you for being generous in ways we are not. I always over tip. Sometimes up to 25% without even thinking. One thing I struggled with recently is what to tip the Peapod delivery guy. We settled on a dollar a bag, but I throw in a couple of extra dollars cuz I'm a sucker. Cabs. Restaurant/bar services. Haircuts, manicures, pedicures, anything spa-related. Any kind of delivery. Oh, and you tip the wood guy. what do you tip delivery guys? even being one once (pianos), i don't like tipping, because i'm usually paying a significant sum for the delivery. that's my rationalization at least. What Emily said, along with bellhops, concierge, and hotel doormen who flag down cabs for me. I don't tip delivery men unless you're talking about the pizza guy or another food delivery person. I always tip at least 20%, usually a little more. 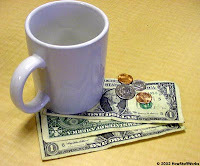 Having once been a waitress, I am empathetic to their lowly paychecks. Everything - I live in Manhattan! Here's my question, I always have the issue of Christmas time. We have in the past tipped the postal man at Christmas. I've heard at Christmas you should give a little card and tip to postal man, garbage man, even extra to your hair dresser. Anyone else do this? Becky, I believe it's illegal to tip a postal worker. I give mine a restaurant giftcard. I tip my hairdresser and spa lady extra at Christmastime. Same with my favorite grocery store bag boy who loads the groceries into my car. I don't tip the garbage men, but I'm sure many people do! I always overpay at childrens' lemonade stands. I'm not sure if that's considered a tip ... or if I'm just a sucker when it comes to little kids and sugary drinks. Lisa, that's awesome! i posted about that once.